A number of volunteers assisting the Carnamah Historical Society & Museum and the North Midlands Project recently concluded the huge task of transcribing and indexing lists of registered livestock brands for Western Australia. The information was extracted from The Brands Directory, which was published within a number of WA's Government Gazettes. All up, a total of 49,136 entries were extracted for the registered brands that existed in 1912, 1924 and 1962 as well as those that were added to the list between 1925 and 1928. The new index is now freely available online. Each entry includes the person's surname, given names, property address, the letters/numbers of their livestock brand and the year of the directory that the information comes from. 1912 through to 1928 are horse and cattle firebrands while 1962 includes firebrands/brands and earmarks used on sheep, cattle, goats and/or pigs. 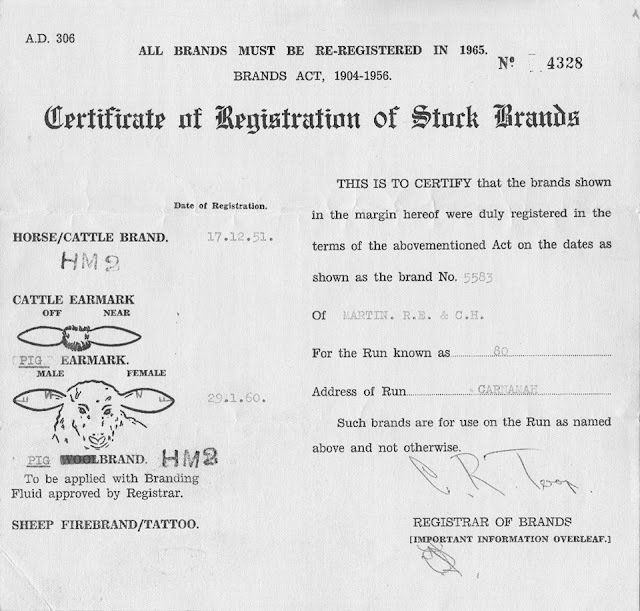 You may be surprised to find more than farmers with a registered livestock brand, as a lot of people who lived in country towns and even suburban areas had a registered brand to mark horses and cows kept for domestic use. For example, Carnamah grazier Donald Macpherson had the brand OSS, which we expected, but more surprisingly his sisters Margaret and Elizabeth also had a brand of their own, which was 1ME. Many people registering a brand in earlier years managed to get their initials as part of their brand, such as Three Springs farmer George Watson with 0GW or Coorow farmer Philip Farley with P3F. Eventually the range of possible brands with two letters and one number was exhausted and in 1926 brand registrations began to be issued reusing the same combinations but with one of the letters oriented on its side, like in the firebrand shown toward the top of this post (so please be aware that some of those listed between 1926 and 1962 may have included a sideways letter). For those not in the know, livestock branding is a technique for marking livestock so as to identify the owner. Firebrands are created by putting a metal branding iron into a fire until it is burning hot. The branding iron is then used to burn the brand onto cattle or horses. The main purposes of branding are to prevent the theft of livestock and to be able to identify the owner when stock strays away from its owner and onto another property. Anyway to get a correction made? I think the listing for Hitchcock & Son at Pynup, Cranbrook should be Hitchins & Son.